The Queen City is queen for a reason. With Sinulog season just around the corner, it wouldn’t be too soon to plan a trip to the island of Cebu, where pristine beaches, hip restaurants, and stunning views—sans the Manila traffic and pollution—await. As more and more tourists flock away from the capital to explore what Visayas has to offer, Cebu is a clear standout: it has something for every traveler, whether they want to relax, party, or get in touch with nature. With stunning architecture resembling that of the Pyramide du Louvre, The Pyramid is your next luxe dinner destination. Its museum-like interiors provide the perfect backdrop for enjoying pasta and wine, right in the middle of Cebu’s bustling I.T. Park district. Known simply as ‘Tops,’ this popular vantage point boasts the best view of the city. Whether you want to catch the sunrise of the sunset, Tops is the best place to do it. Don’t worry about your food options—Cebu Tops Road is lined with cafes for your post-viewing merienda. At the top of Mt. Kirag lies the Sirao Peak, which offers a 360-degree view of the surrounding scenic area. If a few minutes of enjoying the view isn’t enough, there are established campsites (plus, you could head to the nearby Tinisik-uwang Falls for a quick refuge from all the hiking). Badian, Cebu is the prime spot for canyoneering in the Queen City, and it’s all to witness the natural majesty that is the Kawasan Falls. It’s gotten so popular among foreign visitors that TripAdvisor-approved hostels have popped up in the area to accommodate all the demand. If extreme sports are your thing, then you can’t miss this. It’s said that when the Spaniards first set foot on the island over 300 years ago, the locals replied “Camotes” because they had been planting sweet potatoes. It’s also said that if the Spaniards were to sail back to the island at present day that they wouldn’t notice the difference—its crystal-clear waters and white-sand beaches remain immaculate to this day. Can you believe the island is only 2.5 kilometers long and 1 kilometer wide? If you’re looking to avoid large groups of tourists, this is the place—but you’ll find scuba divers from all over converging here. That’s no surprise, considering the country houses the highest concentration of marine life in the world. And according to The Lonely Planet, Malapascua should be one of your first stops. Also known as “Little Amsterdam,” the Celosia Flower Farm in Sirao, Cebu is one of the prettiest landscapes in Cebu—all thanks to the happy celosia flowers that cover the area as far as the eye can see. To preserve the farm’s beauty and sustainability, you’re not allowed to pick or stomp on any of the flowers, but take as many pictures as you like! You’ve heard of rice terraces, but have you heard of flower terraces? In Busay, Cebu lies a ‘floral nirvana’ unlike anything you’ve ever seen—and you can enjoy the view over wine, cheese, and cake at their special cafe. Want a closer look? Hang around at one of their cabanas, crack open a book, and enjoy your afternoon among the flowers. The surreal upside-down craze isn’t going anywhere anytime soon. One step into the Upside Down World in Mandaue City and you’re going to be bamboozled, because every room in the house has got furniture affixed to the ceiling, lending the illusion of being upside-down. If that’s not IG-worthy, we don’t know what is. Widely regarded as the Philippine Taj Mahal, the seven-story, 5,000-square-meter wide Temple of Leah was built for the late Leah Albino-Adarna (yes, Ellen Adarna’s grandmother) by her husband of 53 years, Teodorico. It reportedly cost P80 million to build, but it’s completely open to the public. 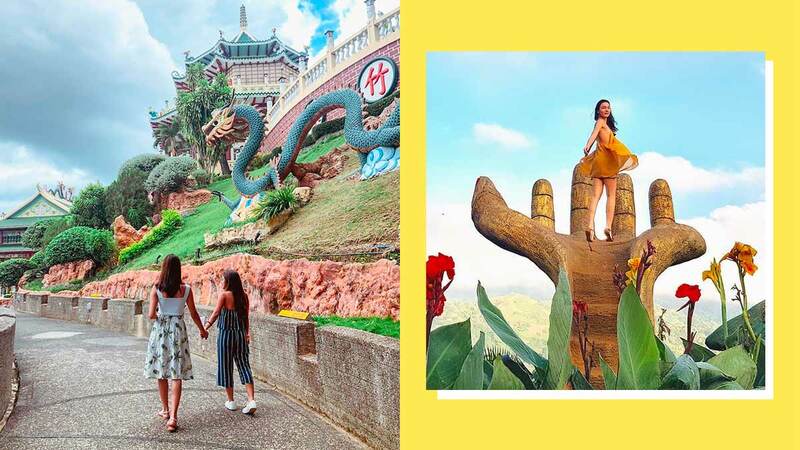 This Korea-inspired attraction in Cordova, Lapu-Lapu is surrounded by—you guessed it—10,000 LED roses that light up at night, making it one of the prettiest man-made sights in Cebu. Imagine coming here at dusk with the love of your life, sharing coffee and good stories. We can’t think of anything better. With Cebu being one of the first islands to be occupied by the Spanish, it’s no surprise that the island holds many connections to 1500s-era colonialism, and that includes the country’s oldest Catholic Church. It holds a statue of Santo Nino that is more than 400 years old. In the courtyard, you’ll find a vast, oceanlike view of red candles, where countless believers have kept the flame going for decades. At 1,013 meters above sea level, Osmena Peak in Dalaguete is the highest point in Cebu. At the top, you’ll be greeted by what looks like the Chocolate Hills’ edgy big brother: instead of perfect hills, you’ll find rough, jagged edges. It’s an easy hike, and temperatures stay relatively lower from the rest of Cebu, so it’s a good cross between chill and active. Cebu has always had a large Chinese community, so this temple was built in the 70s to provide them with a place to pray and meditate. You can use Taoist procedures in communicating with God here, through the use of wooden blocks: you light a joss candle, ask your question, and drop the blocks. The way the blocks fall will indicate a ‘Yes,’ ‘No,’ or ‘Maybe.’ The temple is open to the public, but silence should be strictly observed. Colon is the oldest and shortest national road in the country, and your trip to Cebu isn’t complete without it. This is Cebu’s Divisoria, where you’ll find cheap eats, the best deals, and some of the island’s most dated establishments. The Monastery of the Holy Eucharist in Sibonga, known to many as the Simala Shrine, is so popular among young tourists that it even gets a name drop in the viral Karencitta song “Cebuana.” Imagine the Buckingham Palace and Hong Kong Disneyland rolled into one, and this is what you get: a sprawling, castle-like structure visited by thousands weekly. Owned by the Gorordo family, the two-storey home located in Cebu’s Parian district is now a museum housing antique furniture and artwork. You’ll be surrounded by lush greenery and well-preserved architecture, all while learning about Cebu’s rich history. Ready to get soaked? This above-ground water park located in Mandaue City is a great location for family fun. Waterslide? Check. Huge pools? Check. Jacuzzis? Check. There are even DJs to amp up the vibe at night, plus a host of dining options so you never have to leave the park. If you’re tired of the usual tourist spots, perhaps up is the only way out. And by “up” we mean 37 storeys high in the air, with nothing underneath your feet but a crystal floor. The Sky Walk Extreme will have your heart pumping in seconds. Looking for something more extreme? How about rounding that same height while locked in a rail seat that’s tilted 55 degrees down so you can see the city below you (way, waaaay below you)? Sky Experience Adventure will give you a view of Cebu you’re never going to forget.